Google's New Satellite Takes Its First Picture | OhGizmo! 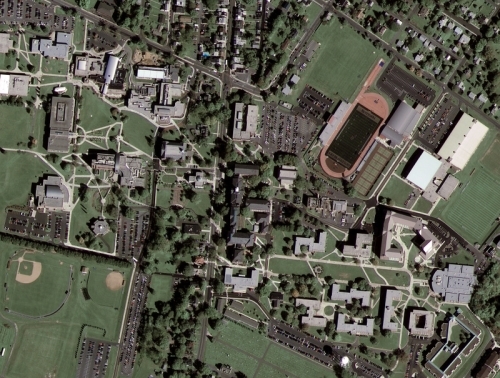 Last week the GeoEye-1 satellite, which is co-owned/sponsored by Google, took a photo(above) of the Kutztown University campus in Pennsylvania. The satellite is primarily funded by the National Geospatial-Intelligence Agency(NGA) with Google being the second largest funder. The satellite is able to take pictures at a resolution of 41cm which is close enough to zoom in on the home plate of a baseball diamond. Google is only allowed to receive photos that are a maximum of 50cm resolution due to government restrictions. The NGA will receive their photos at a 43cm resolution. Even with restrictions the satellite will provide Google Earth and Google Maps with the best pictures yet. Right now the GeoEye-1 is undergoing calibration to ensure it achieves maximum resolution.